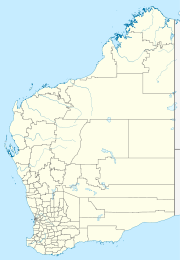 Warralong is a small Aboriginal community, located 120 kilometres (75 mi) south east of Port Hedland and 50 kilometres (31 mi) north of Marble Bar in the Pilbara Region of Western Australia, within the Shire of East Pilbara. The community lies between the Shaw and De Grey Rivers. Indigenous Australians have lived in the area for thousands of years. The first European to arrive in the area was Francis Thomas Gregory who traveled through as part of his expedition in 1861. Pastoralists soon followed and established both sheep and cattle stations throughout the area displacing the Indigenous inhabitants but employing them as cheap labour leading to the 1946 Pilbara strike. The community was established as an offshoot of the Strelley Station, a pastoral lease that operated as a cattle station. Indigenous groups purchased the station in 1972 but abandoned it in 1984. An alcohol ban was formally imposed on the community in 2013 following a spate of alcohol-induced violent incidents. The community is located within the Registered Warrarn 1(WAD82/98) Native Title claim area. The community is managed through its incorporated body, Warralong Aboriginal Corporation, incorporated under the Aboriginal Councils and Associations Act 1976 on 24 September 1993. Warralong Layout Plan No.1 has been prepared in accordance with State Planning Policy 3.2 Aboriginal Settlements. Layout Plan No.1 was endorsed by the community on 1 March 2006 and the WAPC on 31 October 2006. The Layout Plan map-set and background report can be viewed at Planning Western Australia official site. ^ a b c "Warralong Community Layout Plan" (PDF). Taylor Burrell Barnett. 1 January 2006. Retrieved 11 April 2015. ^ Australian Bureau of Statistics (31 October 2012). "Warralong". 2011 Census QuickStats. Retrieved 7 January 2017. ^ "Project Locations". Eon Foundation Inc. Retrieved 12 April 2015. ^ "Booze ban issued for Warralong community in the Pilbara". Perth Now. 28 August 2013. Retrieved 11 April 2015. ^ "Strelley Community School". Aboriginal Independent Community Schools. 2009. Retrieved 11 April 2015. ^ "Reflections from my Immersion into an Indigenous Australian Community". Eve Cogan. 2018. Retrieved 22 July 2018. This page was last edited on 12 October 2018, at 12:11 (UTC).